Birmingham City fan Paul Mitchell has reportedly been given 14 weeks in jail for attacking Aston Villa star Jack Grealish in this weekend’s game. 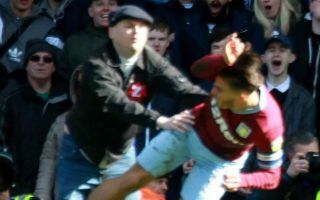 In an extraordinary incident in the Championship’s big game, Grealish was punched by this Blues supporter as he somehow evaded security staff to get on to the St Andrew’s pitch. It’s lucky Grealish wasn’t more seriously harmed, with the incident calling for heightened security in games to protect players. BBC Sport now report of Mitchell being given a short prison sentence, whilst also having to pay a fine of £350 and accept a ten-year ban from attending football matches. Many will certainly feel this sounds about fair, while others will no doubt believe the punishment could have been much harsher. As noted by The Sun, it has been suggested that Mitchell carried out the attack ‘as a joke’, because he thought the Villa captain ‘was a k***’, covering himself in yet more disgrace. Grealish ended the day on a high note, however, going on to score Villa’s winner against Birmingham and settle this tense derby affair and take home a crucial three points.